The Fowl Play Automatic Trap is sponsored by TV personality and host of The Outdoor Network's The Fowl Life, Chad Belding. 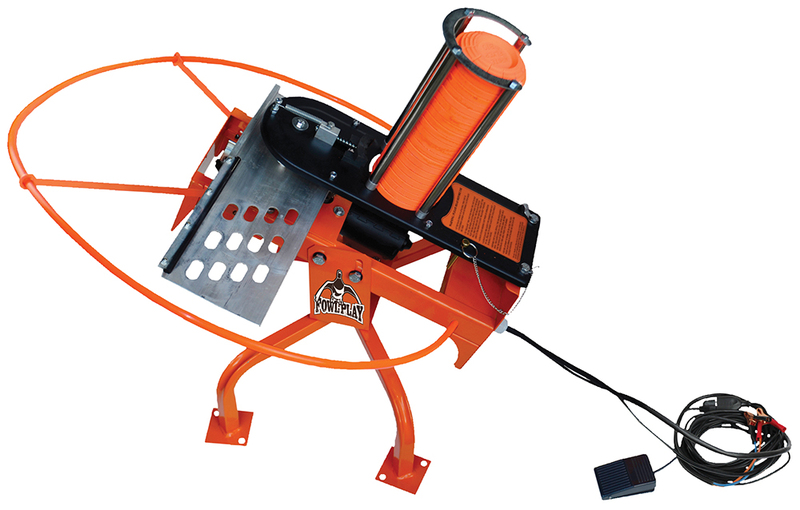 The Fowl Play trap is a great way to practice your duck hunting skills off season. It holds 25 targets, and has a 2.5 second recycle time, with a 5-35 degree angle of adjustment for different throwing planes of 55 yards. The silky smooth feeder tray provides flawless transfer of pigeon onto the throwing arm. It is made of professional grade materials, including an aircraft aluminum arm. The Fowl Play has a 25' pedal release cord, and the ability to accept multiple extension cords. It includes ground spikes. The attachable hi-viz orange safety ring is a visual indicator of throwing arm path. It runs off of a 12V deep cycle marine battery (not included). It is compatible with Do All wireless remote and wobbler.